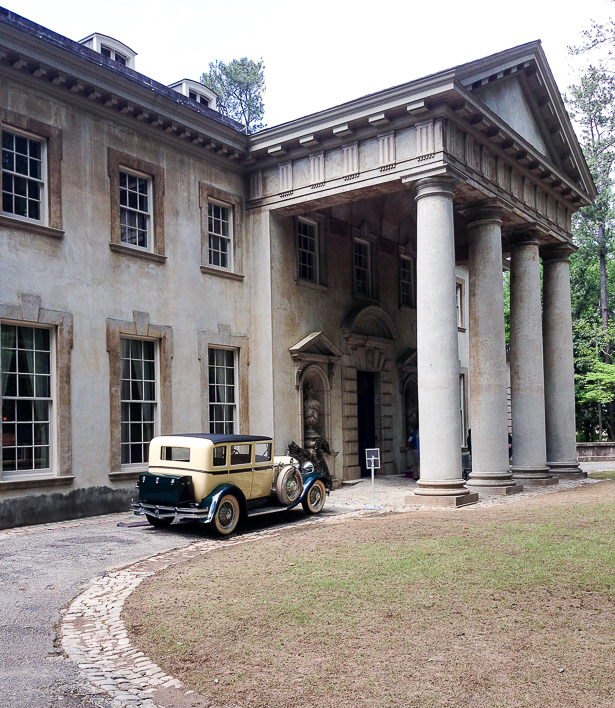 Enamored with the Jazz Age and the New South? 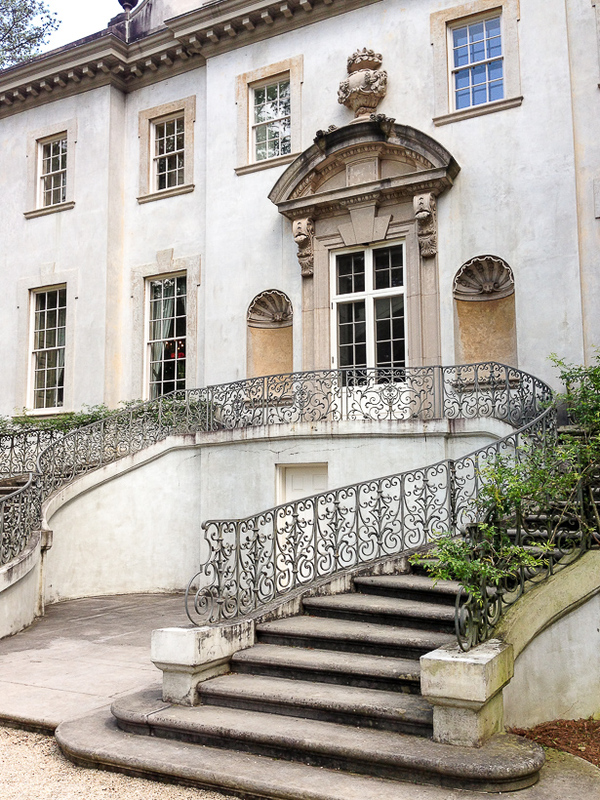 Visit Atlanta’s Swan House for a taste of 1920’s culture, design, and luxury! Down in Atlanta behind the eye popping electric blue doors of a classical style mansion the swinging lilt of jazz and the faint tinkle of a flapper’s jet beads can be heard amid the rushing of tiered fountains and clink of champagne coupes. Crowds of decadently dressed Atlanta elite mill around the house and spill into the gardens, laughing and dancing as they celebrate into the night. This vibrant image of luxurious life in the 1920’s is easy to conjure while visiting Swan House, once the grand home of Mr. and Mrs. Edward and Emily Inman. 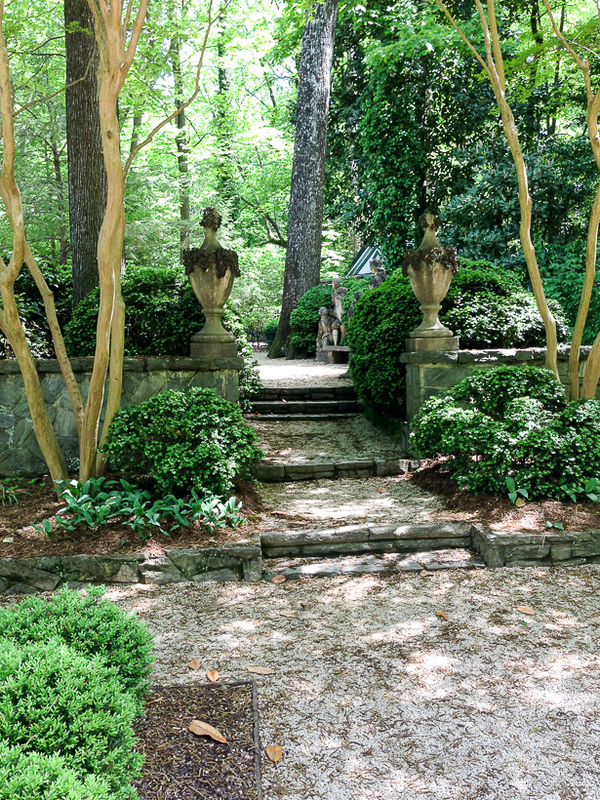 Now a historic house as part of the Atlanta History Center, Swan House welcomes history buffs, design gawkers, and decoristas alike no invitation needed. 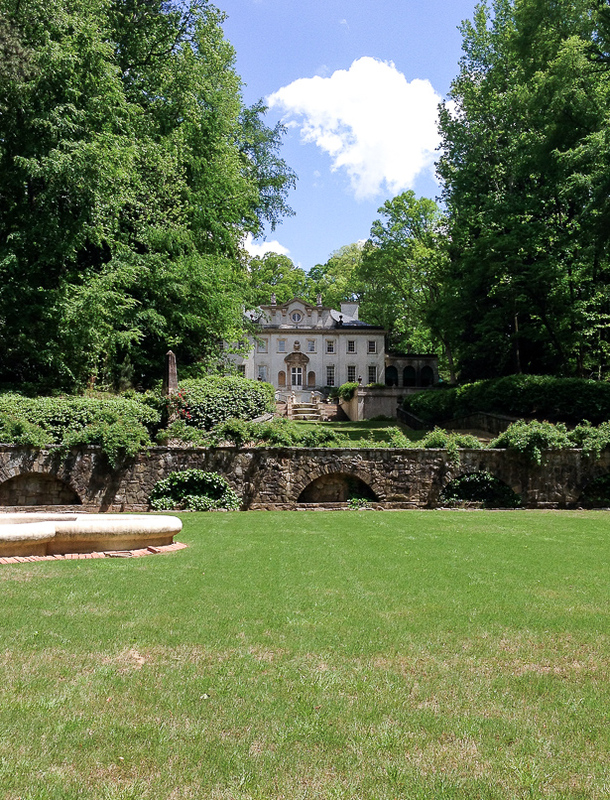 Built in the late 1920’s the house is an excellent example of Second Renaissance Revival style and was designed by well known Atlanta architect Philip Shutze. The blending of Italian and English classical style is evident from the highly symmetrical Italianate façade with double stair cases and cascading fountain to the main entrance’s Palladian four-columned portico. Swan House brilliantly combined classical style and the modern amenities of its time. Edward and Emily Inman came from a long standing Southern family moving from Tennessee to Atlanta after the Civil War. The family re-generated their wealth after the war through a cotton brokerage business as well as stakes in railroads, banking, and real estate. Edward Inman was a Princeton graduate, heir to his father’s brokerage fortune, and rather interestingly an avid automobile racer. Emily Inman was a suffragette and society matriarch, who after Edward’s untimely death at 49 ran the house, her own finances, and the family. 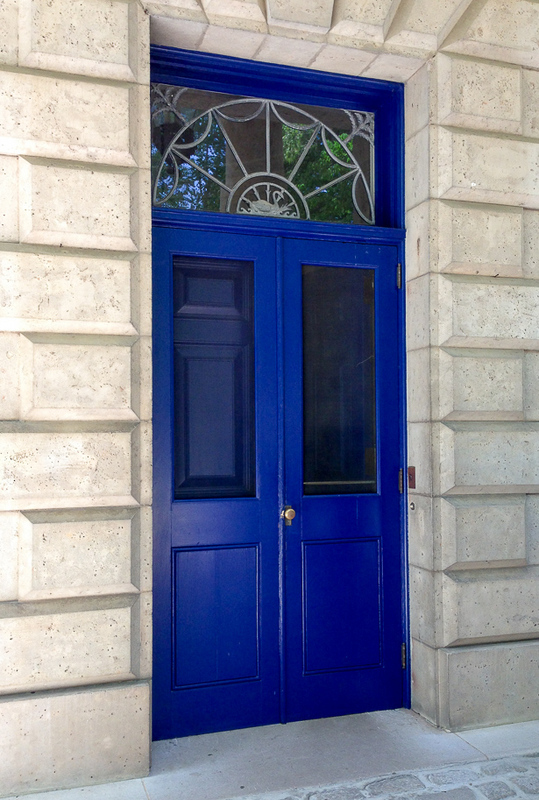 Today, the façade looks weather worn and stately, but interesting when it was built the wooden trim was painted a bright spring green, the fenestration stucco tinted sienna, and the base stucco trim was a faded Venetian yellow. 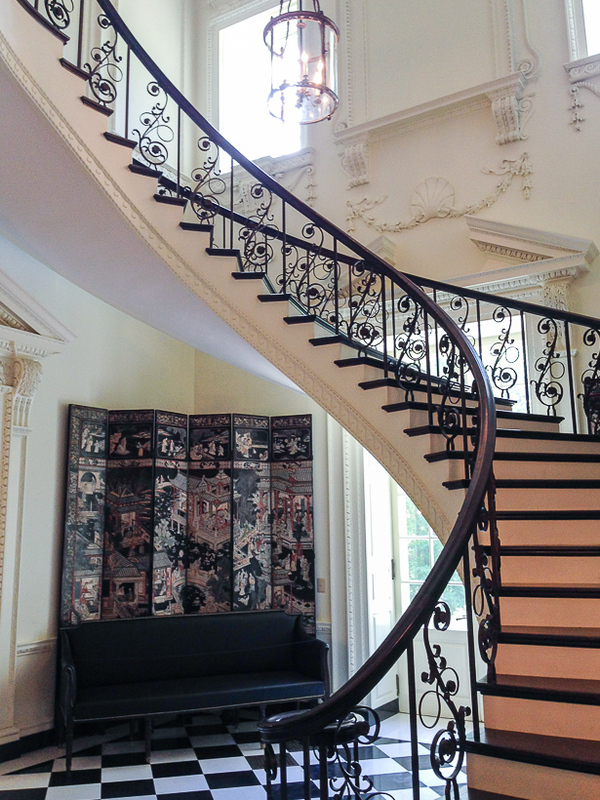 The interior of Swan House matches the glamorous and elegant exterior. 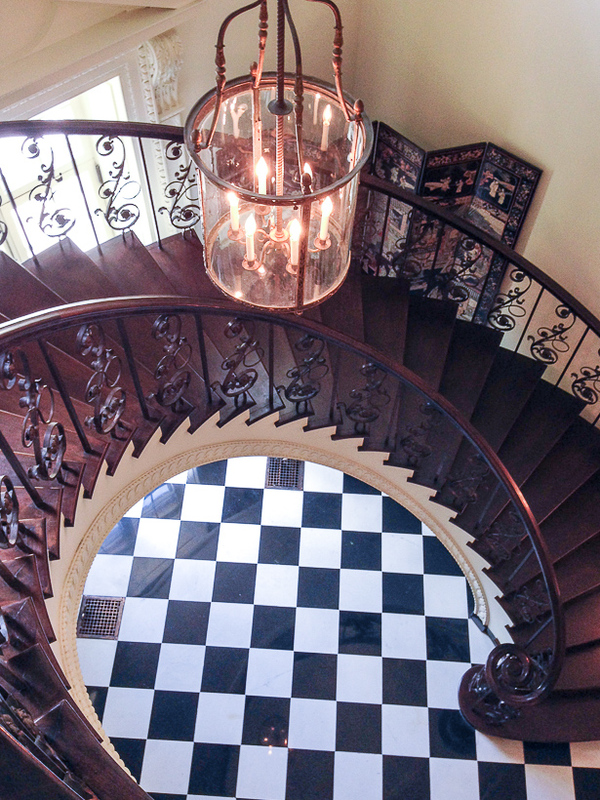 Visitors are greeted in the main hall with a stunning spiral staircase rising above a classic black and white marble floor. A variety of antiques and furnishings from the Inmans still decorate the home, ranging from 18th century antiques to 20th century objects. The home is named for Mrs. Inman’s love of swans, and these elegant birds feature prominently throughout the house in motifs and decor. 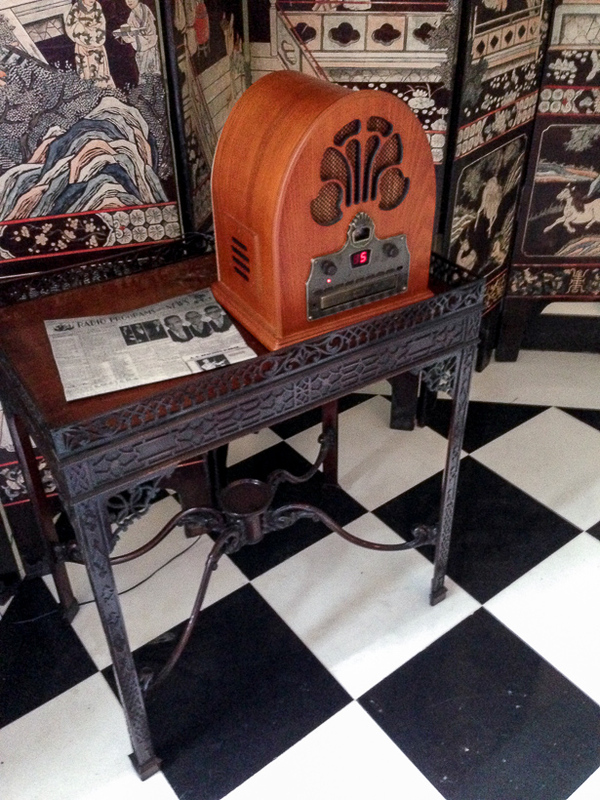 A radio and telephone are on display, emphasizing the technological developments of the period. Hand painted details from the chinoiserie wallpaper in the dining room to the silhouette in Emily Inman’s closet. The view from the bullseye window over the “rear” lawn and fountain garden is spectacular! 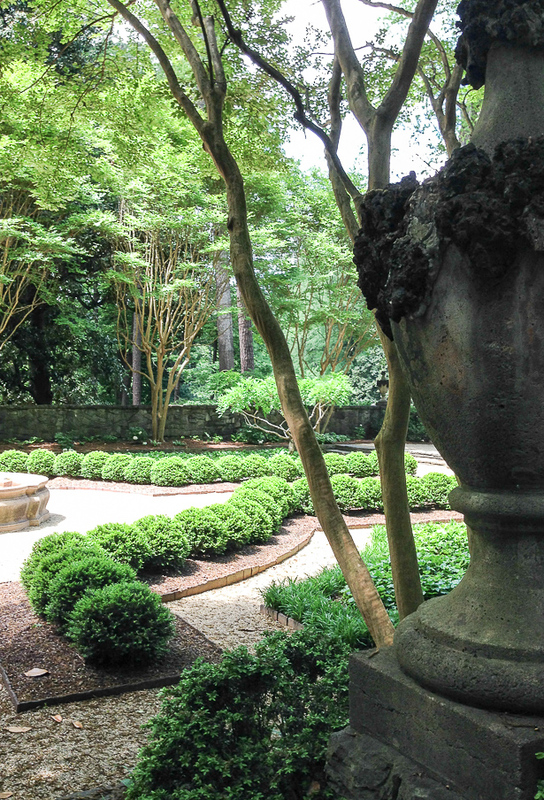 The boxwood garden at the southern side of the house is a calming repose with pebbled paths perfect for strolling. 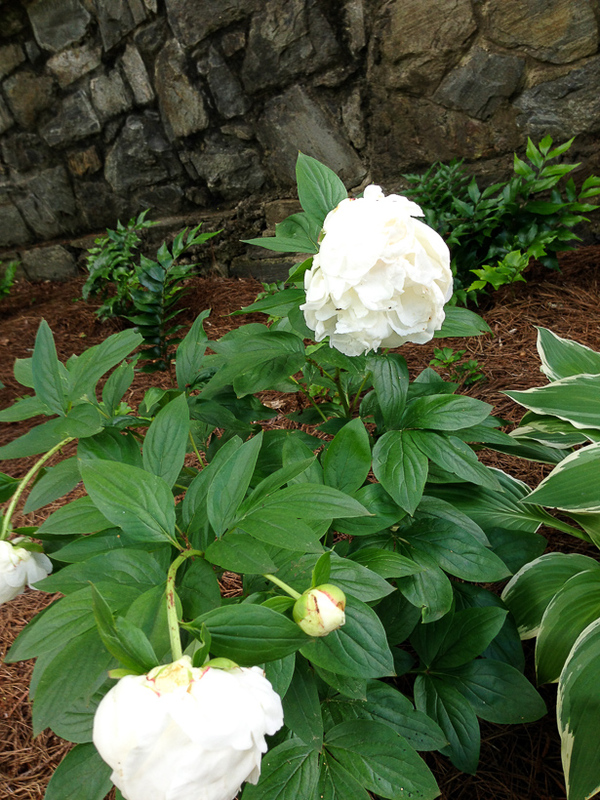 Urns encrusted with sponge stone lead you down into this green oasis filled with trimmed boxwood, hosta, and peonies. 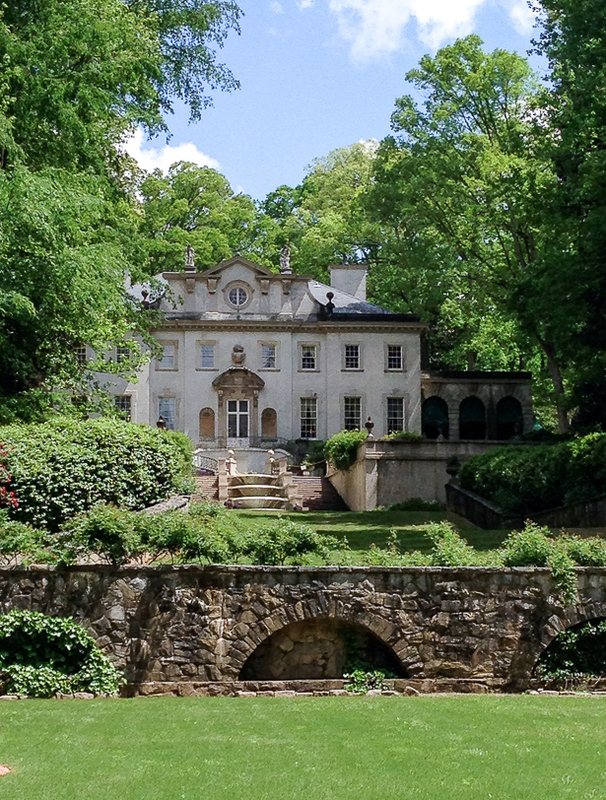 Don’t miss this stunning house the next time you are in Atlanta. Tickets are $21 for adults, $18 for students, and $9 for children, and tickets include admission to all of the Atlanta History Center. What a gorgeous Gatsbyesque home. Thanks for the tour. I will definitely check it out the next time I’m in Atlanta.